“This weekend couldn’t come fast enough” - us after swimming in bulk public holidays over the past two weeks. If you spent your days off tackling chores, napping until you didn’t know what year it is, and catching up on every spicy crime doco on Netflix (same), we have a joyous little list of massive events you need to hit up between April 26-28! GABS 2019 will be getting the party started complete with circus and sideshow performers, a silent disco, their famous ‘house band’, and, of course, BEER on April 27. GABS will be showcasing some of the craziest and coolest ingredients you’ve ever heard of in beer form – we’re talking bacon, Tim Tams, popcorn and edible green ants! There will be over 170 beers and ciders made especially for the festival, showcasing the work of over 100 of Australia and New Zealand’s leading brewers and cidermakers, with plenty of food vendors and trucks, whiskey and wine to balance out the brew fest. Get your tickets here! Here’s the excuse you’ve been looking for to whip out that picnic basket and get snacky in the city! 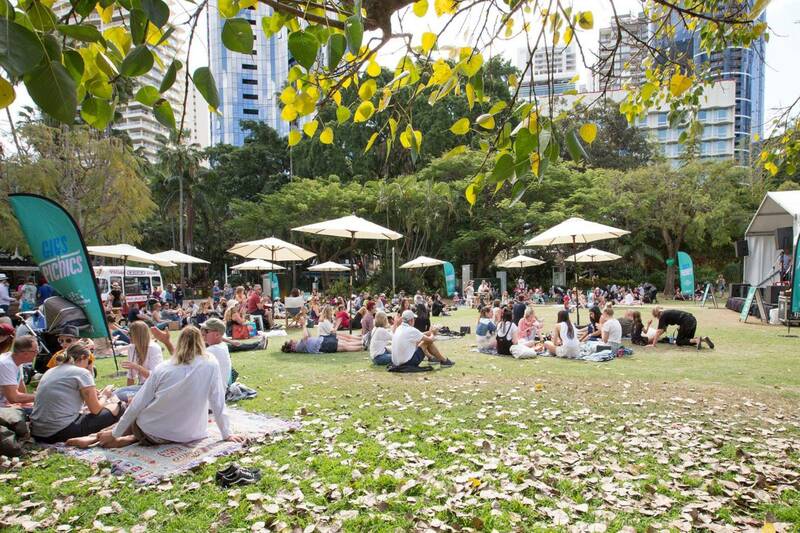 From 12 on April 27, Brisbane City Botanic Gardens will be in full bloom with live music, food trucks, and pre-ordered picnic baskets from The Gardens Club (if you’re as hopeless as we are at packing our own). Rally your mates, hustle up a few blankets, and set yourselves up for an arvo of Gigs & Picnics. No puppy for your birthday this year? We feel you, but we’ve got the next best thing. Fun for all beasts – two and four legged – Barks and Brews at The Brightside is prime puppy watching. This Sunday, April 28 will see the Brightside beer garden turned into a dog-lovers paradise, with an off-leash area, canine catering, live acoustic acts and a portion of bar sales going to the RSPCA. You’d have to be barking mad to miss it. The Brisbane Vegan Markets are back on April 28 for an afternoon to twilight edition, with friendly eats alongside ethical shopping stalls up and running from 12pm-8pm! Stock up on metal straws and merch before diving head first into peach iced tea and falafel kebabs to be mother nature’s new fave child. Right here, right meow. Brisbane’s blessed Cat Cuddle Café is combining your love of petting cats and slinging cash at their second Twilight Market, taking place from 5:30pm to 8:30pm on April 26. Come for the floofs, and stay for stalls supporting rescue groups, with clothes, homewares and everything in between. If you’re hungry for more than the aforementioned treats, the café will be open late for sips and snacks! Find out more about speed patting sessions here.